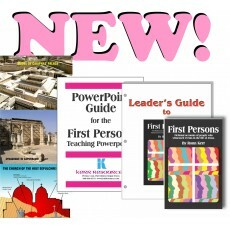 The First Persons SAMPLE PACKET with TEACHING POWERPOINTS includes two First Persons Student Books, one First Persons Leader's Guide, 184 Teaching PowerPoint frames on one CD Rom, and a printed 32-page First Persons PowerPoint Guide.-- all of the First Persons resources in one packet. The Teaching PowerPoint frames are Holy Land pictures, paintings, charts, maps and other images pertinant to the stories in the popular First Persons study and do not require you to have PowerPoint software. The PowerPoints and the textual guide adds another level of teaching material to that which has been so successful in the First Persons Student Books and Leader's Guide. Click on the product image above for complete details about this popular study.The First Persons Teaching PowerPoints is a brand new addition to Kerr Resources' most popular Bible study ever. There are 184 frames of Holy Land pictures, maps, charts, paintings and other images that correspond to the stories in the First Persons Student Book and add substantially to the already thorough First Persons Leader's Guide. The First Persons PowerPoint Guide has pictures of every slide as well as a brief teaching description which, along with the extensive Biblical background material in the First Persons Leader's Guide, makes teaching this course a snap. The PowerPoints can be run on any computer with or without the PowerPOint software because the CD Rom contains a downloadable PowerPoint Viewer. The PowerrPOint Guide can be printed in either color or grayscale. First Persons by Ronn Kerr is a totally new concept in a study program for adults and older youth. Each of the thirteen weekly lessons evolves around a Biblically-accurate story of a person living in New Testament times who witnessed an event in the life of Jesus. A shepherd boy who was at the birth cave. A magi's apprentice. A wine merchant who saw the baptism of Jesus. The wife of a potter in Nazareth who saw Jesus get thrown out of the synagogue. A fisherman who witnessed the call of Peter, Andrew, James, and John. The wine steward at Cana. The sister of an adulterous woman. The centurian at the cross. And others. Each story in the Student Book (click on"Related Products" above) is Biblically-accurate, based on specific Scripture references for study, and filled with detail about life in First Century Palestine. Students not only learn about the particular event in the life of Jesus, they learn how the people of his time lived and played and worked and worshiped. And, they get more deeply involved in study of the Biblical text than with traditional Bible studies. Most important, because the stories are powerful accounts filled with drama, humor and descriptive detail, students really enjoy reading and preparing for class sessions more than with traditional Biblical studies. In fact, in test classes, "I really enjoyed reading for the class!" was the most common response. The extensive 100-page Leader's Guide (click on "Related Products" above) is 8 1/2 x 11" and can be divided up to be distributed to various session leaders without having to make sure the Leader's Guide gets to the right person every week. Individual sections can be saved off the CD Rom and emailed to instructors. The Leader's Guide contains scholarly Biblical background material, leadership suggestions, and creative discussion starters tied to each story. This thirteen-week course is a perfect substitute for those quarters when dated studies like the International Lesson Series just don't work. When that time comes, try First Persons and then return to the dated studies the next quarter.